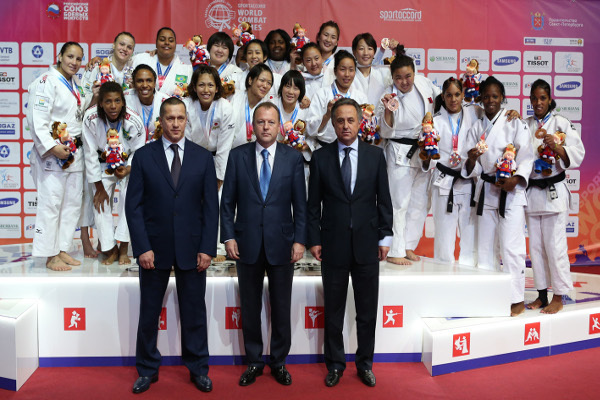 The opening day of the 2013 World Combat Games marked the start of the team judo competition on Saturday at the St Petersburg Sports and Concert Complex. After a pulse-pounding opening ceremony on Friday evening, the first day of competition featured the women’s team event which gripped spectators as star-laden teams fought for World Combat Games honours. 2013 World Team Championship winners Japan and hosts Russia were in action along with Mongolia, Cuba, China, Brazil, Kazakhstan and France. Mr. Vizer, IJF and SportAccord President, who has been appointed as a member of the IOC Coordination Commission of the Tokyo 2020 Olympic Games by IOC President Mr. Thomas Bach, was in attendance. Ahead of the final block, Russia’s Olympic champions Arsen Galstyan (-60kg), Mansur Isaev (-73kg) and Tagir Khaibulaev (-100kg) staged a masterclass with young judoka. The youngsters warmed up by displaying their talents on the competition tatami as their flawless technique left the crowd in awe. Then Russia's leading trio entered the tatami to warm applause and invited judoka from the group to train with them in the middle of the tatami. After a group photo, the London 2012 winners held an autograph session and posed for pictures beside the tatami. The masterclass session was the brainchild of World Combat Games Judo Ambassador and Russian Judo Federaton General Team Manager Ezio Gamba. Gamba said: "I think the masterclass went well, we wanted to have an opportunity for children to train with our Olympic champions at the World Combat Games. It is important to show our champions and for them to continue to inspire people. The families and coaches of the children were able to watch as it was held on the competition tatami and I think it was interesting for the crowd to see." Special guests included World Combat Games Sambo Ambassador, former judoka and mixed martial arts legend Fedor EMELIANENKO, Russian Sports Minister Mr. Vitaly MUTKO, Co-Chairman of the Russian Union of Martial Arts, Mr. Yuri TRETNEV. The action continues on Sunday as the men take to the tatami on the second and final day of the judo competition. High-flying Japan were crowned 2013 World Combat Games gold medallists as they starred in the final with a 4-1 demolition of Brazil. 2013 World Team champions Japan were sublime all day long and had plenty of energy in reserve for the most important match of the day. The youthful Japanese team secured their place in the final with a 4-1 triumph in the semi-final against Cuba having started their day with a 5-0 rout against Mongolia. Brazil were equally impressive in the previous rounds as they disposed of France 4-1 in the semi-final having also registered a 5-0 score in the quarter-final as they dominated China. -52kg: GOMI Natsumi (JPN) shocked world silver medallist Erika MIRANDA (BRA) who was penalised with one shido for passivity and that decided the contest despite a last-ditch tani-otoshi attack with was awarded yuko but was then immediately overturned. -57kg: Asian champion ISHIKAWA Megumi (JPN) pulled through against world champion Rafaela SILVA (BRA) on shido penalties as the Japanese judoka was penalised twice while SILVA had three indiscretions against her name. -63kg: Youngster Ana GRINCEVICUS (BRA) was handed the task of keeping Brazil alive in the match and despite her best efforts she received three shido penalties to hand KATAGIRI Natsumi, who finished fifth at the 2012 Tokyo Grand Slam, the win and confirm Japan’s place on the top of the medal podium. -70kg: 2013 World Team Championships silver medallist Maria PORTELA (BRA) suffered a similar fate as she was penalised twice against OSUMI Yuka (JPN) who could take to the tatami knowing the gold medal had already been secured. Shido penalties again settled a contest as Brazil’s winless run continued. +70kg: World number two Maria Suelem ALTHEMAN (BRA) was determined to put Brazil on the scoreboard and threw SHIRAISHI Nodoka (JPN) with a harai-makikomi for a waza-ari and there was no way back for the Japanese heavyweight. 4-1 JPN. Japan stormed into the final as they swept past Cuba 4-1. -52kg: Japan went 1-0 up as Cuba’s two-time Olympic silver medallist Yanet BERMOY ACOSTA (CUB) was unable to compete today due to injury to hand GOMI Natsumi (JPN) the win. -57kg: ISHIKAWA Megumi (JPN) held down Anailys DORVIGNY (CUB) with a mune-gatame to double her team’s lead. 2-0 Japan. -63kg: Mariset ESPINOSA (CUB) halved the deficit by toppling KATAGIRI Natsumi with an osoto-gari for ippon. 2-1 JPN. -70kg: OSUMI Yuka (JPN) sealed a place in the final for her country by besting Onix CORTES (CUB). 3-1 JPN. +70kg: Idalys ORTIZ (CUB) lost out to Nodoka SHIRAISHI (JPN) as Japan inflicted one final defeat on their rivals. 4-1 JPN. The second semi-final saw 2013 World Team Championship silver medallists Brazil overwhelm World Team bronze medallists France 4-1. Brazil’s Erika MIRANDA (-52kg), Rafaela SILVA (-57kg), Maria PORTELA (-70kg) and Maria Suelem ALTHEMAN (+70kg) all prevailed while Anne-Laure POLI–BELLARD (-63kg) pulled one back for her country. 4-1 BRA. Japan dominated a world-class Mongolian team as they ran out 5-0 winners. -52kg: Urantsetseg MUNKHBAT (MGL) was stunned by relative unknown judoka GOMI Natsu (JPN) who pinned her opponent with a yoko-shiho-gatame for ippon. 1-0 JPN. -57kg: Dusseldorf Grand Prix bronze medallist ISHIKAWA Megumi (JPN) conquered World Judo Masters winner Sumiya DORJSUREN (MGL) as a shido for passivity was all that separated the rivals after five minutes. 2-0 JPN. -63kg: KATAGIRI Natsumi (JPN) maintained Japan’s perfect run as she bested Ulaanbaatar Grand Prix winner Tserennadmid TSEND-AYUSH (MGL). The highly-regarded Mongolian received a fourth shido for not taking a grip to receive hansoku-make to guarantee a place in the semi-final for in-form Japan. 3-0 JPN. -70kg: All Japan Judo Championships runner-up OSUMI Yuka (JPN) defeated former Moscow Grand Slam silver medallist Naranjargal TSENDAYUSH (MGL) to increase Japan’s streak. 4-0 JPN. +70kg: 2010 World Combat Games silver medallist SHIRAISHI Nodoka (JPN) sealed the rout as she bested Ulaanbaatar Grand Prix winner Munkhtuya BATTULGA (MGL) as the Mongolian received two shido penalties for passivity while SHIRAISHI only received one for a false attack. In the second quarter-final Cuba humbled China in a thrilling match which was decided in the fifth and final contest. Olympic and world champion Idalys ORTIZ (+70kg) sent Cuba through as she defeated former Qingdao Open bronze medallist MA Sisi (CHN). 3-2 Cuba. 2013 World Team bronze medallists France faced hosts Russia in the third quarter-final. -52kg: Former Sarajevo European Cup bronze medallist Natalia PAVLOVA (RUS), lost out to former European University Championships winner Lucile DUPORT (FRA) in -52kg action. After receiving a shido for passivity, PAVLOVA was thrown with a harai-makikomi to register a waza-ari for DUPORT. The French judoka received a shido for passivity with no further additions to the scoreboard ensuring an opening win for France. 1-0 FRA. -57kg: Club European Championships bronze medallist Morgane BRUNET (FRA) looked to extend her team’s advantage against Orenburg European Cup bronze medallist Ilona BURYACHENKO (RUS). However, as the crowd rallied for the BURYACHENKO, she was able to provide the victory after BRUNET was penalised with a shido for passivity. 1-1. -63kg: Minsk European Open winner Anne-Laure POLI–BELLARD (FRA) restored France’s lead by outworking multiple-time national champion Larisa CHEREPANOVA (RUS). BELLARD, who went ahead with a yuko, added a second by holding down her Russian rival with a kesa-gatame for yuko as the latter crucially escaped before higher scores were awarded. Despite her scrambling efforts in ne-waza, CHEREPANOVA was lethargic in attack and was unable to trouble the scoreboard. 2-1 FRA. -70kg: The match-deciding contest pitted former Junior World Championships silver medallist Lucie PERROT (FRA) against European Team Championships bronze medallist Ekaterina DENISENKOVA (RUS). A waza-ari score for PERROT proved the difference as France progressed and sent hosts Russia into the repechage to start their bid for a bronze medal. 3-1 FRA. +70kg: London European Cup winner Rebecca RAMANICH (FRA) lost out to Madrid European Open winner Anaid MKHITARYAN (RUS) who salvaged a consolation win for Russia with a forceful kami-shiho-gatame pin. 3-2 FRA. 2013 World Team silver medallists Brazil met Kazakhstan in the fourth quarter-final. A star-studded Brazilian team dismantled Kazakhstan with ease as they ran out 5-0 winners. 2013 World silver medallists Erika MIRANDA (-52kg) and Maria Suelem ALTHEMAN (+70kg) registered victories along with world champion Rafaela SILVA (-57kg), former School Games silver medallist Ana GRINCEVICUS (-63kg) and World Military Championships winner Maria PORTELA (-70kg). 5-0 Brazil. In the first bronze medal match Mongolia were the first country to secure a place on the medal podium as they eventually won a classic match against 2013 World Team bronze medallists France. Mongolia showed their fighting spirit to bounce back from a 5-0 defeat at the hands of Japan in the quarter-final. Their world-class team took control when Uransetseg MUNKHBAT (-52kg) won the opening contest before Sumiya DORJSUREN (-57kg) put Mongoia with touching distance of a place on the medal podium. Anne-Laure POLI-BELLARD (-63kg) pulled one back for France and her teammate Lucie PERROT (-70kg) ensured a tense finale with all the pressure place on the heavyweights in the fifth and final contest. Munkhtuya BATTULGA (+70kg) pressed Rebecca RAMANICH (+70kg) from the outset and, with a waza-ari from an ouchi-gari, she belied her significantly smaller fame to control her opponent until the time elapsed. In the second bronze medal match Cuba overcome hosts Russia 4-1 to repeat their 2013 World Team Championships result in St Petersburg. Former Russian national champion Natalia PAVLOVA (-52kg) was awarded the opening contest as Cuba have been unable to field a -52kg judoka due to injury. Cuba reeled off four consecutive victories as they have established themselves as one of the leading women’s teams in the sport. Former Cuban Championships bronze medallist Anailys DORVOGNY (-57kg), national champion Mariset ESPINOSA (-63kg), World Judo Tour standout Onix CORTES (-70kg) and world number one Idalys ORTIZ (+70kg) were all successful.